Camp Richardson's 23rd annual Oktoberfest returns on Saturday and Sunday, Oct. 7-8. 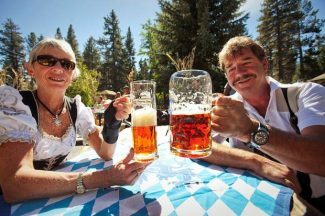 Don your lederhosen and dirndls — it’s time for Camp Richardson Historic Resort and Marina’s 23rd annual Oktoberfest. 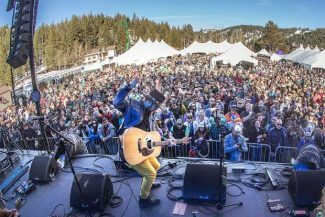 From seasonal brews and food to live music and family-friendly fun, it’s a Bavarian party that’s fit for all ages and kicks off fall like few other parties in the Tahoe Basin. Let’s be real — this is what you came for (apart from the food, obviously). This year, seven seasonal brews will be on tap: Leingukegal’s Oktoberfest, Spaten Lager, Blue Moon Harvest, Sam Adams Oktoberfest, Deschutes Hopzeit, New Belgium Wheat and St. Archer Hoppy Pilsner. Crispin Hard Cider will also be available. Spend the big bucks on a stein and settle in for a long day of festive drinking. The second main event of any quality Oktoberfest. Camp Richardson offers unique IPA beer-infused bratwurst made specifically for the event, along with turkey legs. Keep an eye out for a mix of German desserts, too. The Gruber Family Band brings the ambiance of a German Oktoberfest to South Shore with traditional tunes on both Saturday and Sunday. Adding to the fun are the sausage-eating contest (sign-ups conducted at 1:30 p.m. Sunday afternoon for the 3 p.m. event) and the owner and dog dress-up contest (we can’t wait to see pets in lederhosen). Of course, there will also be yodeling and stein-holding contests. Winners receive gift certificates for food, activities and lodging at Camp Richardson. Need to burn off those calories you took in devouring sausage and Leingukegal’s Oktoberfest brew? Walk around the Camp Rich site and check out the multiple local vendors that will be on hand throughout the weekend. Look forward to shopping from Tahoe-crafted specialties from Tahoe Mountain Soap, Tahoe Bathworks, RISE design apparel and more. Camp Richardson’s Oktoberfest is a family-friendly event, but your kids certainly won’t be guzzling steins of Sam Adams with you. While you enjoy your libations, take the young ‘uns to check out craft booths, face painting, balloon art, the bouncy house, a bungee platform and, of course, the pumpkin patch. Oktoberfest is held Saturday and Sunday, Oct. 7-8, from 10 a.m. to 5 p.m. Entry is free, with beer and food tickets available for cash-only purchase on-site. Parking is also complimentary, as is the bike valet (held in front of Mountain Sports Center). Patrons who ride bikes to the event receive an ice cream coupon upon checking into the valet. Camp Richardson Historic Resort and Marina is located at 1900 Jameson Beach Road. Learn more about the venue’s Oktoberfest online at http://www.camprichardson.com/oktoberfest.